Designing ventilation systems with the unit mounted in a skylight or a flat roof is easy. With a low profile cowl, the Lo-Carbon T-Series Roof model is suitable for installation in horizontal, angled (max pitch 30deg) and vertical glass and for fixing plates in roofs. For vertical windows or walls in exposed areas and single and double glazing including most types of glass up to 32mm thick. Greater thicknesses can be accommodated using extended fixing rod sets. Both sizes of Vent-Axia roof plate assemblies can be fitted easily into flat roofs. With energy saving in mind, Lo-Carbon T-Series models are supplied complete with an integral, instantaneous, automatic louvre shutter concealed behind the interior grille. It will operate on both intake and extract and at any angle of mounting. The shutter is electronically controlled by an actuator with a damped action giving quiet operation during instant opening and closing. When the fan is used with a Lo-Carbon T-Series controller, the shutter can be set open with the fan motor switched off to provide natural ventilation without the security risk of an open window. 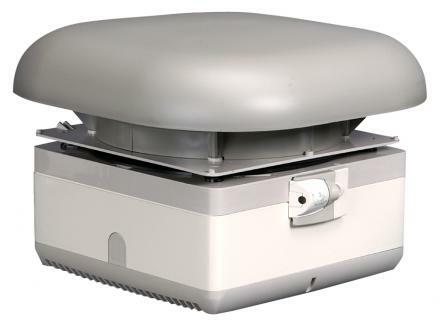 LoWatt T-Series roof models may be installed through solid roofs using a roof plate assembly and, if required, an eggcrate grille or louvred grille in the ceiling below. Alternatively, if ventilation is from a suspended ceiling, single spigots and flexible ducting may be used to connect the unit and extract grille. LoWatt T-Series roof models are suitable for fixing through corrugated sloped and vertical cladding using a suitable soaker flange. A suitable sealing compound should be used between the plate and the exterior unit seal. LoWatt T-Series roof models may be installed in fixing plates with zinc or lead weathering apron (provided by others), fitted directly to a tiled or slated roof to provide a water-tight installation. A suitable sealing compound should be used between the weathering apron and the exterior. Designing ventilation systems with the fan mounted in a skylight or a flat roof is easy. With a low profile cowl, the Lo-Carbon T-Series Roof model is suitable for installation in horizontal, angled and vertical glass and for fixing plates in roofs. For vertical windows or walls in exposed areas and single and double glazing including most types of glass up to 32mm thick. Greater thicknesses can be accommodated using extended fixing rod sets. Both sizes of Vent-Axia roof plate assemblies can be fitted easily into flat roofs.